Welcome to Norway, by way of melancholic, ’70s-inspired psych-doom. Andreas Hagen, also of stoner/doom metal band High Priest of Saturn, takes command of vocals, bass, guitar, and drums, to bring you the fjords of his homeland in a way that, while having an atmosphere of occultism, delivers evil in a way without the blasts of frosts or mouldering DM his countrymen are most known for. The self-titled debut of his project Sadhak, released on cassette by Shadow Kingdom, hovers on waves of warm, fuzzy tone, complemented by forlorn vocals and cymbal-heavy drum playing. You can almost feel the fog in the tube-driven reverb of the rhythm guitars that are a near-perfect foil for the melodic, well-phrased leads and clean voice that teeters on the edge of key, but stays on the right side of it. 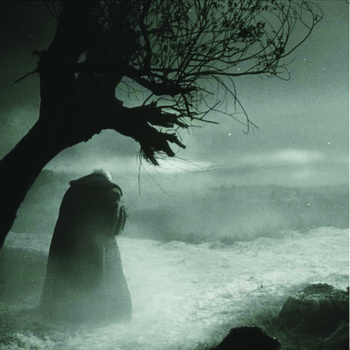 Hagen’s is a doom that does without deeply detuned guitars, and instead uses the overall sound as a whole to bring the swirl of wintry death into the listener’s soul, all while solemnly nodding to ancient black metal gods with its simple keyboards recalling Filosofem’s ‘Dunkelheit’ (on the chorus of ‘The Perfection of Wisdom’). And the album’s understated, but intriguing black-and-white cover brings on that ever-familiar, ever-desired since of aural cold, effectively evoking the music the tape contains. In all, a worthy achievement, as stoner-inflected doom doesn’t often exude enough moroseness for me. In this case, Sadhak brims overflowing with it. ~ by cliftonium on April 16, 2014. Yo Jimbo, 2 for 2 this week yo. I got this a few weeks back in the mail. I really enjoy this demo. This entry was posted on April 16, 2014 at 6:04 pm and is filed under ALL REVIEWS, S-reviews.You can follow any responses to this entry through the RSS 2.0 feed.You can leave a response, or trackback from your own site. Previous: You won’t go to bed hungry no, not tonight….